The numerous dunes spreading over this expanse of coastal desert house a diverse array of unique flora and fauna. Dunes as far as the eye can see in the Namib Sand Sea. The numerous sand dunes of the Namib Sand Sea are seen spreading across a vast expanse of coastal desert in southwestern Africa along the Atlantic Ocean. This sea of dunes houses a diverse array of unique flora and fauna. Listed as a United Nations Educational, Scientific, and Cultural Organization (UNESCO) World Heritage Site, the Namib Sand Sea is the only one of its kind in the world. It is recognized for its beauty, ecological and geographical processes, and the plants and animals which have adapted to thrive in its habitats. The site attracts hundreds of tourists as well as scientists and students alike. The vast Namib Sand Sea stretches across more than three million hectares in proximity to Namibia's Atlantic Ocean coastline. The Namib Sand Sea is unique since it is the only global coastal desert influenced by fog. The region is home to hundreds of sand dunes, whose form and height are constantly shifting with time due to wind currents. Fog is the chief source of water in the sand sea, and it sustains the flora and fauna present, some of which are endemic to the region. 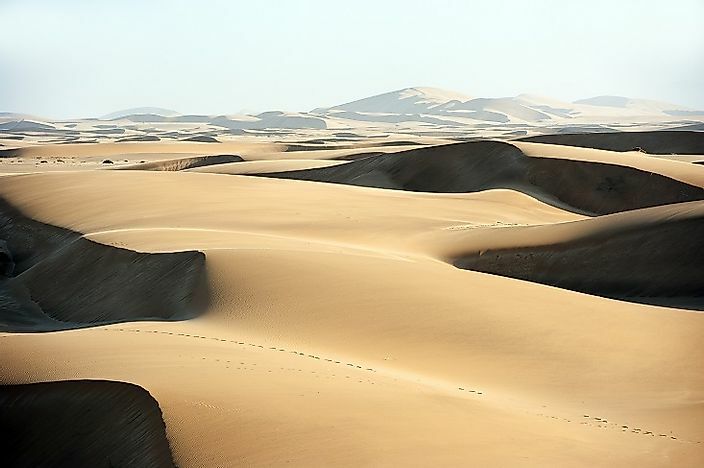 The formation of the sand dunes occurred as a result of the transport, and deposition as sand, of different elements over a distance of thousands of kilometers from the hinterland. This transportation is facilitated by wind and ocean currents and rivers. The interaction of these materials results in spectacular landscapes and habitats. Two dune systems make up the sand sea, the oldest being a consolidated one about 21 million years old. The younger dune system lies above, the older one, and it is about 5 million years. The sand dunes feature a variety of colors and textures and exhibit unique and spectacular scenery. The property is part of a larger conveyor system, wherein marine and aeolian processes coordinate to transport mineral materials over long distances. The sand dunes are geographical, scenic and evolutionary consequences of interactions between wind-influenced processes and ecology as well as geology. Flora and fauna in the region exhibit rare behavioral and morphological characteristics as adaptations to the unique conditions. The species are outstanding examples of the evolutionary processes which take place in the context of extreme environments. The sand sea encompasses a range of land forms, including inselbergs, playas, gravel plains, rocky hills, rivers, coastal flats, and canyons. The sand sea is home to the rare shrub-like plant known as Welwitschia mirabilis, which can live for 2,500 years in the desert habitat. The plant gives rise to only two leaves, which twist on themselves as protection from the winds. Fauna in the region has adapted to the water-scarce and dry area. The wildlife includes the gemsbok, ostrich, zebra, springbok and sand grouse. The region is also home to a rare beetle species which collects fog, as well as the Web-Footed Palmatogecko. The Namib-Nakuluft National Park encompasses large portions of the southern part of the Namib Sand Sea. The park is home to some of the old and tallest sand dunes in the world. The National Park sits on an area of 19,216 square miles and conserves the region’s unique flora and fauna. Most parts of the sand sea are uninhabited, owing to the extreme conditions and absence of infrastructure. Increasing tourism traffic has however had negative impacts on the region, ranging from littering, off road driving, sanitation concerns, illegal camping and disturbance of wildlife. Invasive alien plant and animal species, distributed in the region by ephemeral rivers, are emerging threats to the native flora and fauna. Other threats include water extraction and mineral exploration. Where Is The Namib Desert? What Are The Negative Effects Of Sand Mining?